AIUB Journal of Science and Engineering [AJSE] is a joint publication of the AIUB Faculty of Science and Information Technology and the AIUB Faculty of Engineering. This journal publishes original, empirical and innovative works in basic, functional and support areas of science, technology and engineering disciplines. It is primarily devoted to the extension and further development and dissemination of knowledge in the field of science and engineering for the benefit of academics as well as practicing enterprises based on research and development [R&D]. Within the boundary of the above-mentioned aims and scope, the journal covers a wide area of interest in the field of science and engineering. In the backdrop of global scenario, local and regional issues are picked up on a systematic manner to help develop the insight into the scientific and engineering practices and theoretical underpinnings. Although the research papers are expected to be from local and regional authors, AJSE heartily welcomes authors from all over the world. The journal is published once a year in English in the month of August. Scope of publishing special issues is kept open for future needs. 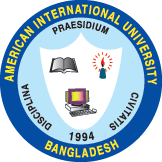 The printed versions of AJSE are available at the Office of Research and Publications [ORP], Administration Building, American International University-Bangladesh [AIUB]. All queries should be addressed to the Editor.